SDR Energy implements a very advanced production monitoring and control system which allows us to continuously oversee the running and performance of energy plants and also to manage invoicing and the sale of energy to the grid. In all energy generating plants, we manage and carry out preventive and corrective maintenance very rigorously, using specialised equipment and highly qualified personnel and creating sustainable employment. This results in maximum plant efficiency, the sale of more energy to the grid and, therefore, higher profitability for the project. Using our own management programmes supported by specialised software like PVSyst and databases like Meteonorm, we are able to carry out plant production studies which offer all the guarantees needed to ensure the viability of our projects. 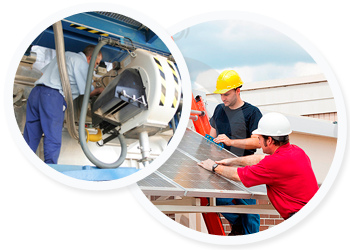 We currently operate and maintain more than 90 photovoltaic power plants, monitoring production and incidents with Ingecon Sun Manager and Monsol and even checking telemetered measurements in real time at both inverter and measurement unit level. We also conduct video surveillance using Smart Viewer.